Nikola Tesla is an enigma wrapped in a mystery. Not bad going for an electronic engineer. 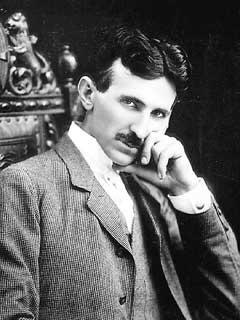 Born, so the stories go, in the middle of a thunderstorm in Serbia, Tesla has left a fascinating legacy to the world today. Magnetism is measured in Tesla, a unit named after him. But it is perhaps one victory we owe most to Tesla for. He fought a battle to show that alternating current (A/C) was superior to direct current (D/C) when it came to transmitting electricity over a distance. His opponent was none other than America’s most respected celebrity inventor, Thomas Edison. In the so called Battle of the Currents Tesla and his entrepreneurial partner George Westinghouse eventually won (they had maths on their side). If he hadn’t the world would have been filled with electrical substations at the end of each road, because D/C doesn’t do distance well (why? see the box below). But the fight was a really dirty one – there was ego and money at stake. Edison got his employees to badmouth A/C, to try and convince the public it was dangerous. They used A/C to execute stray cats and dogs to try to prove to the press that A/C was more dangerous than Edison's system of D/C. They even filmed the A/C electrocution of Topsy, a circus elephant from Coney Island! Edison’s spin doctors also tried to popularise the term "Westinghoused" to mean being electrocuted. The battle cost an astronomical amount, and toward the end Tesla pulled out, tearing up the contract that could have made him the world's first billionaire, and leaving Westinghouse to capitalise on the final victory. Tesla retreated, and invented the world’s first remote controlled boat, but he had another card up his sleeve – he had invented the radio, and had the patent. But success was short lived. After a few years the US courts decided that Guglielmo Marconi was the inventor of radio and Tesla lost out again. In fact in 1909 Marconi was awarded the Nobel Prize for Physics for the invention of radio, and the rumour was that Tesla and Edison’s fight had lost them the chance of being included in the award. Never daunted, in 1899, Tesla moved to Colorado Springs, Colorado, where he could have enough room for his high-voltage, high-frequency experiments. He told reporters that he was conducting wireless telegraphy experiments, transmitting signals from a mountain called Pikes Peak in Colorado to Paris. He transmitted extremely low frequencies through the ground as well as between the earth's surface and the ionosphere, and patented the ideas. He also calculated that the resonant frequency of the Earth was approximately 8 Hertz (Hz). Later in the 1950s, researchers confirmed that the resonant frequency of the Earth's ionosphere was in this range, but chose to name it the Schumann resonance. Tesla was invisible again. Tesla was no good with money. His genius and lifetime of invention led to him dying alone of heart failure, in a New York hotel room, impoverished at the age of 86. The story goes that the documents he had were seized by the American secret service under the direct orders of J Edgar Hoover. 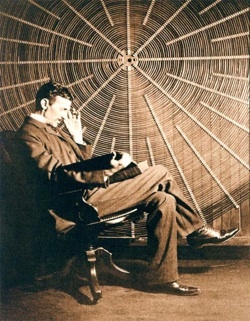 Tesla had been developing his radical ideas about transmitting power without wires through the earth over great distances. He called this a peace ray; it could manifest electrical power in mid-air wherever it was needed on the Earth. He also claimed to have worked out a 'dynamic theory of gravity' – even Einstein failed at this – but it was never published. Tesla’s life has of course been the subject of movies; he most recently appears in the film ‘The Prestige’, played by David Bowie. Tesla is also featured on the bank notes of Serbia. So when you next plug in your mobile phone charger or use wifi, remember Tesla, the invisible genius who made it all possible. AC is better for distributing power over a distance because it allows the easy changing of voltages with a transformer. Power is calculated as current times voltage (P = IV). For a given amount of power to be sent, a low voltage requires a higher current. But metal conducting wires have resistance; some of that precious power will be lost as heat in the wires. Theory (always important to know the theory) says that power loss is given by P = I²R. So from this its obvious that low-voltage, high-current transmissions will cause a much greater power loss than high-voltage, low-current ones. This fact holds whether DC or AC is used. But, and here is the clincher, transforming DC power from one voltage to another is difficult and expensive. In Tesla’s day it needed a large spinning device called a rotary converter, and moving parts are always a problem. But with AC these voltage changes can be done with simple and cheap transformer coils with no moving parts and no maintenance. Tesla wins in theory and in practice.